After a month-long self-imposed silence, the North Korean diplomatic team is back with a vengeance. Chairman Kim Jong Un kicked off 2019 with a New Year’s speech and meeting with President Xi Jinping in China. DPRK Vice Chairman Kim Yong Chol visited Washington and North Korean Vice Foreign Minister Choe Son Hui held high-level meetings with U.S. Special Representative for North Korea Stephen Biegun in Stockholm.1 The White House announced on January 18 that a second Trump-Kim summit would take place by the end of February 2019 in Vietnam. The fact that the U.S.-North Korea summit in June 2018 did not lead to concrete deliverables raises concern among many observers about the prospects for the second meeting between Donald Trump and Kim Jong Un. If bilateral engagements between the U.S. and North Korea do not lead to rapid progress on denuclearization, the Korean Peninsula may have to come to terms with a difficult reality. There is more than the North Korean nuclear crisis at stake given that the second U.S.-North Korea summit could also influence the trajectory of regional dynamics as well. Using survey results conducted by the Asan Institute for Policy Studies, this issue brief aims to analyze South Korean attitudes about the Korean Peninsula and prospects for the denuclearization of North Korea. To sum up, more than half of South Koreans (58.7 percent) think that the likelihood of military conflict on the Korean Peninsula in the immediate future is low. While most South Koreans are pessimistic about the likelihood that North Korea will denuclearize, the majority (54.6 percent) is hopeful that a deal between the U.S. and North Korea may lead to the eventual denuclearization of North Korea in the foreseeable future. 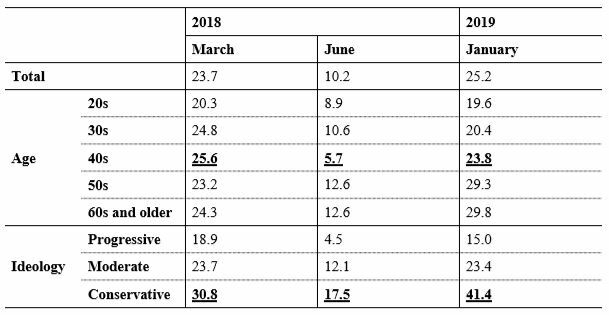 It is important to point out that this percentage is lower than that of June (75.3 percent) and March (55.8 percent) 2018. The findings show that the decline appears to be most pervasive among middle-aged (the 40s) and conservative respondents. 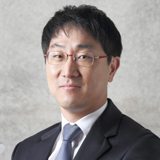 The data also shows that the South Korean perception of denuclearization is correlated with the respondents’ favorability of specific countries and leaders, which suggests that the South Korean public perception about denuclearization is potentially sensitive to the geopolitical climate and the external environment. 2018 was a turning point for the Korean Peninsula in that it ushered in a new era of engagement with North Korea. The two Koreas participated in the Winter Olympics, held series of bilateral summits, and opened the inter-Korean liaison office in Kaesong. However, engagement with North Korea was neither always smooth nor linear. The U.S.-North Korea summit on June 12 did not deliver concrete results and diplomacy stalled for the remainder of 2018. 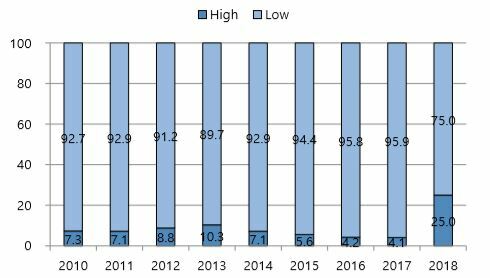 From the public’s point of view, however, the situation was more favorable in 2018 than in previous years. 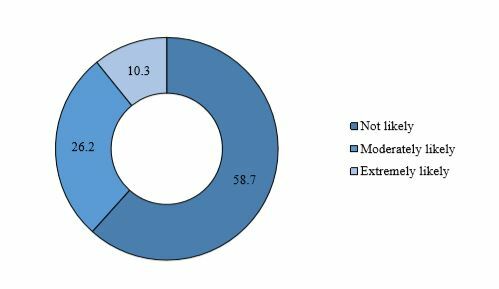 First, 58.7 percent of respondents said the likelihood of military conflict on the Korean Peninsula was low (Figure 1). In contrast, only one-sixth (10.3 percent) said the likelihood of military conflict on the Korean Peninsula was extremely likely while 26.2 percent said it was moderately likely. On a zero-to-ten scale, 31.4 percent of respondents said military conflict on the Korean Peninsula is not likely at all (0). Although negotiations with North Korea have failed in the past and the second U.S.-North Korea summit could shift the direction of talks on denuclearization, the overall public opinion regarding the North Korean situation remains relatively optimistic. The results imply that the reduction of North Korean nuclear threat, expectations for the bilateral negotiations between the U.S. and North Korea, and the improvement in inter-Korean relations are three factors that determine public perception about the security status of the Korean Peninsula. Next, we also asked about the likelihood of North Korea giving up its nuclear weapons. Since 2010, the Asan Institute for Policy Studies has been collecting survey data on the possibility of North Korea giving up its nuclear weapons (Figure 2).2 For much of this time period, the likelihood that North Korea will give up its nuclear weapons was never higher than 10.3 percent. 2018 is the first year that this figure hit a record 25 percent. The improved situation on the Korean Peninsula appears to have raised South Korean expectation about denuclearization. North Korea has not tested any missiles or nuclear devices in 2018 and diplomatic engagement between North Korea, South Korea, the U.S., Japan, China, and Russia is in full swing. Despite all this, a sizable supermajority still thinks that denuclearization is not likely (75 percent). When asked, however, what they thought about the talks leading to a denuclearization effort, a majority (54.3 percent) of South Koreans stated that North Korea can be denuclearized in the foreseeable future. This figure is decidedly lower in January 2019 compared to March and June 2018. This suggests that the South Koreans are generally optimistic but the overall perception in 2019 is worse than it was in June 2018. In early 2018, inter-Korean relations improved following the Winter Games in PyeongChang and the Trump administration expressed a desire to hold a summit with Kim Jong Un. In March 2018, 55.8 percent of South Koreans predicted that North Korea would denuclearize in the near future. After the Singapore Summit in June, the South Korean outlook on denuclearization turned decidedly more positive (75.3 percent). However, there appears to have been a change in public opinion as a result of the lull in diplomacy after the Singapore Summit. This is somewhat surprising given that some media reports suggest that North Korea has taken steps to suspend tests, dismantle the Punggye-ri nuclear test site and permanently shut down the Tongchang-ri missile test facility. Although the second U.S.-North Korea summit has been announced for the end of February 2019, survey results in January 2019 suggest that South Koreans have become more pessimistic about denuclearization. Our findings also show that this trend is fairly consistent across all ages and ideology, but the most notable increase was among conservatives and respondents in their 40s. In particular, when we examine the results by age, we see that the increase in pessimism was greatest among those in their 40s. The increase was four-fold among those in their 40s – 5.7 percent in June 2018 to 23.8 percent in January 2019. The results imply that as diplomacy took a back seat for much of the second half of 2018, individuals in their 40s held unreasonably high expectations about denuclearization; this explains the greater disappointment in January 2019. We also found that conservatives tended to be more pessimistic than moderates or progressives with 41.4 percent of conservatives stating in January 2019 that North Korea will not denuclearize. This is a two-fold increase from 17.5 percent in June 2018. Again, this data shows that denuclearization is perhaps the single most important issue for the conservatives and there appears to have been heightened expectation among conservatives about this prospect as a result of the Singapore Summit. But the lack of follow-through appears to have contributed to the disappointment in January 2019. Interesting patterns can also be found when we look for a correlation between prospect for denuclearization and South Korean public sentiment about neighboring countries and their respective leaders. In particular, there is a positive correlation between the level of optimism and the favorability ratings of the U.S. and North Korea. This is because the prospect for denuclearization is linked to progress on the diplomatic front. When analyzing the results, the average favorability ratings for the U.S. and North Korea and their respective leaders were categorized into two groups (i.e. “high” and “low”). South Korean prospects for denuclearization were more clearly divided along the favorability ratings for North Korea and Kim Jong Un. There was a positive correlation between the South Korean level of optimism for denuclearization and the favorability ratings for North Korea and Kim. In the survey, only 51.6 percent of South Koreans who held low favorability of North Korea said there would be denuclearization. On the other hand, 81 percent of those who favored North Korea were optimistic about denuclearization. 54.4 percent of those who had low favorability of Chairman Kim was optimistic about denuclearization. Results show a 30 percentage point difference in the level of optimism between those who have different favorability ratings for North Korea and Chairman Kim. On the contrary, the results show a negative relationship between prospects for denuclearization and favorability of the U.S. and President Trump. That is, the higher the level of hostility toward the U.S. and President Trump, the higher the level of optimism about denuclearization. However, the magnitude of the relationship between favorability and prospects for denuclearization is lower for the U.S. and President Trump in comparison to the results shown for North Korea and Kim Jong Un. 62.8 percent of South Koreans who favored the U.S. were optimistic about denuclearization and 74 percent of those who did not favor the U.S. were optimistic about denuclearization. The difference in the level of optimism was 10 percent. For President Trump, the difference between the two groups was within the margin of error. There is yet to be concrete progress on denuclearization of North Korea since the first U.S.-North Korea summit in June 2018. Talks between the U.S. and North Korea have stalled due to disagreements about the sequencing of denuclearization and sanctions relief. However, South Koreans appear generally optimistic about the situation on the Korean Peninsula with 58.7 percent of South Koreans believing that the likelihood of military conflict on the Korean Peninsula is low. This is because 1) the North Korean nuclear and missile threats are not as apparent, 2) South Korean expectations about the U.S.-North Korea summits is higher, and 3) inter-Korean relations have drastically improved in 2018. However, the findings also show that South Korean public perception can shift depending on the general mood and changes in the overall situation on the Korean Peninsula. Considering the fact that denuclearization of North Korea is likely to be a long and grueling process, using public opinion to outline the administration’s policy on North Korean diplomacy is less than ideal. Rather the Moon administration should seek a more pragmatic approach that prioritizes principles rather than political expediency. 1. North Korea chairman Kim Jong-un visited President Xi Jinping in China for four summits in the last ten months. The visits in 2018 were all related to the first U.S.-North Korea summit. The first summit held on March 25 – 28, 2018 was to discuss cooperation on denuclearization measures. The second and third summits (May 7 – 8 and June 19 – 20) were held before and after the U.S.-North Korea summit and Chairman Kim briefed the summit results to President Xi. The fourth summit took place in January 2019 and some speculate that the next summit will take place around the second U.S.-North Korea summit. 2. Asan Annual Survey (2010-2018). The answer choices for the survey question that asked the likelihood of North Korea giving up its nuclear weapons were “extremely high,” “moderately high,” “moderately low,” and “extremely low.” When analyzing the data, we generated dichotomous variables. To see the detailed analysis, please refer to the appendix below. 3. Asan Poll (Mar. 21-22, 2018; Jun. 18-20, 2018; Jan. 7-9, 2019). 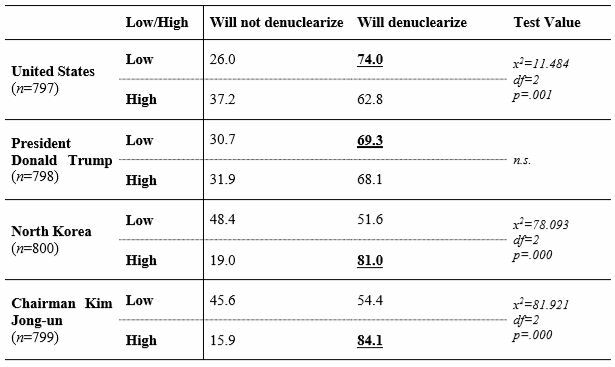 The survey question in Table 1 asks, “How many years do you think it will take for North Korea to denuclearize?” This table is an analysis of the open responses by survey respondents. For those who provided a timeframe for denuclearization, their results were categorized as “will denuclearize” while those who denied denuclearization would occur were categorized as “will not denuclearize.” Respondents who said they do not know or refused to answer were recoded as “don’t know/refused to answer” for the data analysis. 4. Asan Poll (Mar. 21-22, 2018; June 19-20, 2018; Jan. 7-9, 2019). 5. Asan Poll (Jan. 7-9, 2019). The survey questions asked respondents whether North Korea would denuclearize and favorability ratings toward the U.S. and North Korea. Responses “don’t know” and “refused to answer” were considered missing values and excluded from the data when conducting the analysis. 6. There was a positive trend between South Koreans’ favorability ratings of North Korea and that of Chairman Kim. This shows that a strong positive correlation exists between the favorability ratings of North Korea and Chairman Kim and the level of optimism toward denuclearization. 7. For a more detailed analysis of favorability rating trends, please see pages 8-11. Kim Jiyoon, Kang Chungku, and Kildong Kim. “U.S.-North Korea Summit and South Koreans’ Perceptions of Neighboring Countries.” Asan Report (2018). 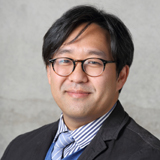 Yumi Ko is a Research Associate at the Asan Institute for Policy Studies in Washington, DC. She received her B.A. in Economics and Political Science from the University of California, Berkeley. Her research interests include Northeast Asia security issues, U.S.-ROK alliance, and human rights.